The new year is always keenly anticipated by our watch team at Weir and Sons, as the covers come off the latest offerings from the great and the good of the watchmaking world, and the major events begin with the Salon International de Haute Horlogerie in the lavish surroundings of the Palexpo in Geneva, and among those to stop us in our tracks was an exciting and very special new Luminor Submersible piece from Panerai. Unlike many of its peers in the luxury watch sector, Panerai have an almost cult following, which has evolved from a legacy of producing hard-wearing instrument watches, originally created for use in the most demanding environments by the Italian Navy. Factor in their bold, no nonsense and uniquely distinctive styling, the Italian company have almost unconsciously bridged that elusive crossover between hardy professional instrument and highly sought after lifestyle timepiece. Milled from an ingot of matte finished bronze, and measuring 47mm across, the new Panerai Luminor Submersible 1950 3 Days Automatic Bronzo is certainly a substantial piece, and its chunky, robust features underline the utilitarian purpose of its antecedents. 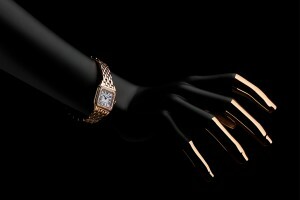 It combines practical functionality with several subtle vintage styling cues lifted from the original of the species which was produced in 1950, such as the unidirectional rotating bezel, with luminous dot ‘zero’ reference, and of course, their trademark crown protection system, the bridge-like feature which locks down over the crown, adding to the watch’s already impressive presence. The bronze case has a brushed, grainy finish, and fresh out of the box it almost glows, but bronze is not your typical case material and pretty soon a patina begins to develop as it becomes exposed to the elements. How quickly this happens depends on what exactly it is exposed to. Kept dry, and in particular away from salt water, the process takes some time, but even after one month of normal wear a subtle but noticeable darkening of the metal occurs. Taken into the sea and the process accelerates rapidly, and the watch takes on an amazing, heavily weathered appearance before long. This is because bronze (a tin and copper alloy) reacts to the elements. If you’re reading this and recoiling in horror, you shouldn’t; the aging is very much a deliberate characteristic of the Bronzo, and a direct connection with the brand’s enduring association with maritime instruments, and the previous version sold out quickly. Expect similar this time around, as production is again capped at only 1,000 pieces and demand is already pressing. Where its immediate predecessor featured a dark green dial, the 2017 PAM00671 has a deep blue one. The chunky round applied hour indices are filled with luminous Super LumiNova, as are the hours, minutes and small seconds hands, providing excellent legibility in all light conditions. The date is positioned at the 3 o’clock position, and in an often overlooked detail the disc matches the dial colour (blending in so much better than the more commonly used black-on-white). 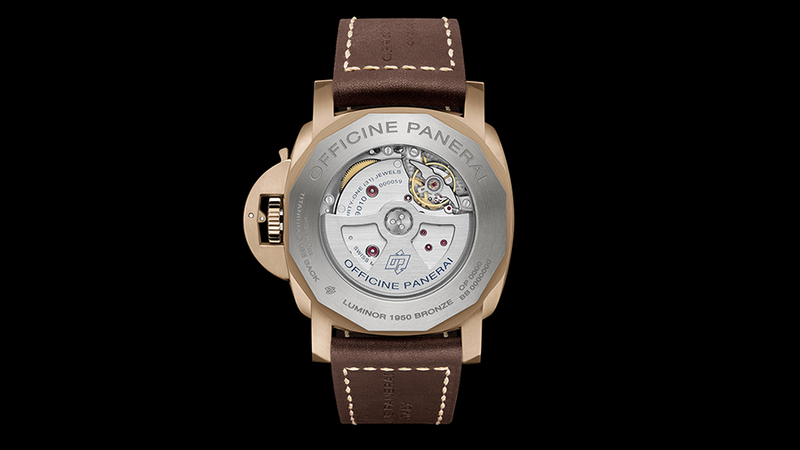 The model is powered by Panerai’s renowned in-house P.9010 self winding calibre, which provides a power reserve of 3 days, dispensed by its dual spring barrels. There is an exceptional plain beauty to be found in Panerai’s calibres, and a transparent exhibition caseback, contained in a titanium rear bezel, provides a view of its mechanism, and the spinning oscillating weight within. Despite its size, the Panerai Luminor Submersible 1950 3 Days Bronzo wears comfortably on the wrist, and is served up on a Ponte Vecchio calfskin brown leather strap with white stitching, with a sturdy tang buckle. 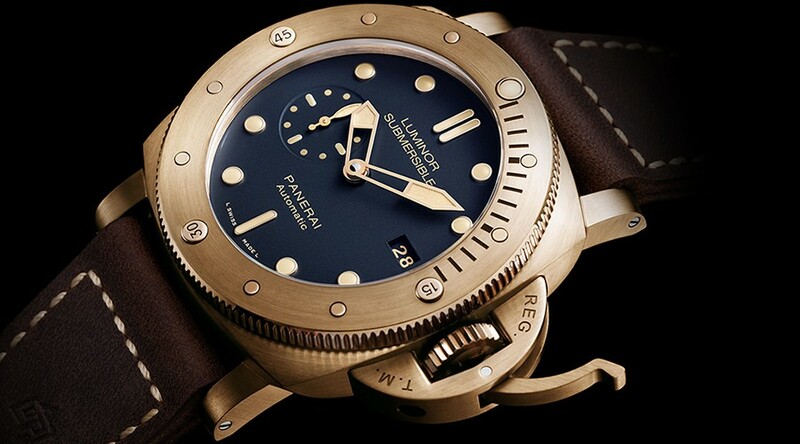 Our thanks to Johnny McElherron for his interesting and informative review of the Panerai ‘Blue Bronzo’.